This novel is part of the My Heart Belongs series from Barbour. Click here to see all the books in the series! Andrea has reviewed most of the books here on OWG blog! Thank you Andrea! This story opens on the Underground Railroad, December 1863. Clarissa, disguised as Joshua, is conducting passengers north of Gettysburg when she is pulled off the trail and ordered into the woods. Unsure if her captor is friend or foe, the “little scrap” of a thing is kicking and fighting until the secret code is spoken. Slave catchers are after them. After the immediate danger has passed, Liberty reveals himself to her. He is a well-known, famous even, operator on the Underground Railroad. Clarissa is not impressed. Her temper up, she snarls at him. “Don't call me an itty-bitty scrap of nothing ever again...” There's more but I won't spoil it for you. I can tell you this is the first of many missions the two work together. They must overcome many obstacles to find trust and become friends. I found their squabbles to be very entertaining despite the dangerous situations they were in. In Clarissa's everyday life, she is a strong-willed, fiery red-head, a little bit spoiled by her loving parents and extremely smart. She talks to herself a lot too. I love her garret bedroom! She spends time with Kyle Forrester, a seminary student. She is a bit forward in walking alone with him, unchaperoned. But he does not agree with her views on slavery or the Underground Railroad, he thinks the law and judges should handle it. Can they overcome their differences to have the courtship he desires? 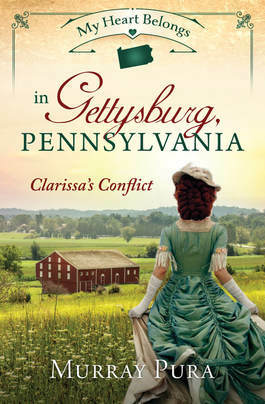 Clarissa is grounded by her town, Gettysburg. She knows all its nooks and crannies, all the side streets and surrounding farms, fields and trees. She loves the people in it. Only her parents and the Reverend know her secret. She is safe in Gettysburg. I cannot tell you more of Clarissa's conflict without spoilers. I will say a deep love develops (but I won't say with who) and when war comes to Gettysburg, that love is battle tested. There is a very moving passage near the end where Clarissa is asked what she is looking at. She says, “my Gettysburg...” You must read the rest for yourselves, it would not be fair if I repeated the rest. I do recommend this book. Especially if you are a fan of Civil War era stories. President Lincoln makes a brief appearance too. This book definitely has more grit and drama than other books in series. In the end, though, it is clear that Gettysburg is truly where Clarissa's heart belongs. 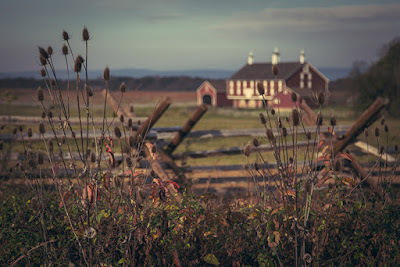 GIVEAWAY: A paperback copy of My Heart Belongs in Gettysburg. Leave a comment to enter. It's a very interesting story Melanie. Mary, I thought it was a great read! Hi, Joy! I have loved reading and reviewing the My Heart Belongs Series. As far as I know there is one more coming in January. By day being courted by a seminary student by night a conductor on the Underground Railroad! Wow! Clarissa sounds like her own woman, I would love to read her story! Thanks for sharing! Clarissa is quite a strong young woman, Robin. She has great parents. I have read some of Murray's books and really enjoyed them, thank you for the chance to win a copy fo this one. I really enjoyed this book of Murray's. Gettysburg is wonderfully described by this author. Wonderful review, Andrea! I adore the My Heart Belongs series. I love how different each book in the series has been. It starts right on a passageway! It certainly grabbed my attention. Thanks for stopping by, Perrianne!